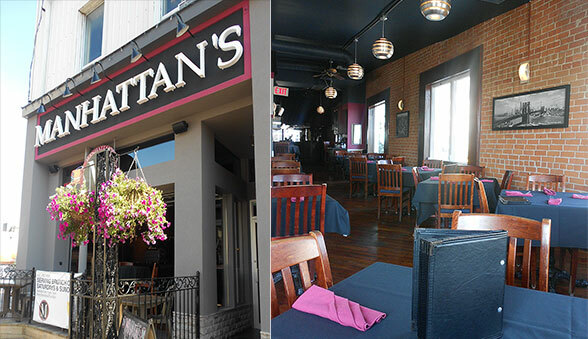 Manhattan’s Bar & Kitchen has undergone some major renovations regarding the menu. Located at 147 Dunlop Street East, directly east of Fitzy’s and across the street from Hooters, Manhattan’s aims to please. Deciding to treat my mother and younger brother to an evening out, I thought we might test Manhattan’s newly revamped menu. If you loved that Manhattan’s previously had a menu largely centered on seafood, you may rest assured because the menu remains to have a plethora of seafood options available. Manhattan’s continues to be a very classy, posh restaurant. Diverse paintings hung on the walls, adding a rather appropriate finish to the magenta and charcoal themed interior. The restaurant has a little patio out front where you can enjoy the open air and sun. At the opposite end of this narrow, rectangular restaurant there are grand windows that open to Barrie’s beautiful waterfront view. My family and I chose to sit by the windows where we were able to enjoy the view as well as breathe in the hot summer breeze. Despite the menu being fixated on seafood, there is still a variety of items on the menu that the non-seafood lover can enjoy. If you come to Manhattan’s on a Monday to Friday anywhere from 11 am until 5 pm, you can enjoy certain appetizers for $5. I enjoyed a delicious Red and Blue Salad (a small if you order off the $5 menu), which was made up of spinach, blueberries, strawberries, and pecans tossed in a blue cheese and poppy seed dressing. It was the perfect refresher for such a warm evening. Maintaining the healthy theme, my mother chose the Grilled Vegetables – white balsamic and herb grilled vegetables on spinach with a red pepper aioli. She also ordered the Sweet Chilli Chicken, which was breaded chicken breast with sesame seeds sprinkled on top of a sweet chilli sauce. She could not stop boasting about how incredible her meal was! Manhattan’s is even kid friendly. My brother ordered a cheese pizza (which is made with a house tomato sauce) with French fries on the side. The children’s menu is a main dish with a side for only $6. The exciting thing about this restaurant is that the whole family can enjoy a tasteful dinner without having to worry if everyone will be able to find something on the menu to enjoy. Manhattan’s has surely covered all the bases. Manhattan’s menu is quite high in price, but this is a restaurant where quality and quantity are both guaranteed. You’re paying more, so you expect to get more – right? Right. The food is remarkable and the portion sizes are large. Manhattan’s gives you your monies worth and makes you want to come back time and time again. With a rather extensive drink menu, a true connoisseur of alcoholic beverages will never go thirsty here. Manhattan’s has plenty of ales, cocktails, mocktails, martinis, and for the winos, a variety of white or red wines. On the weekends, Manhattan’s also has live music. If you’re looking to enjoy some casual drinks and some appetizers, pre-drink before a night out on the town, or have a quiet, romantic evening, Manhattan’s should be your next check point. The servers will do everything in their power to impress you. And I promise you, you’ll want to go back.